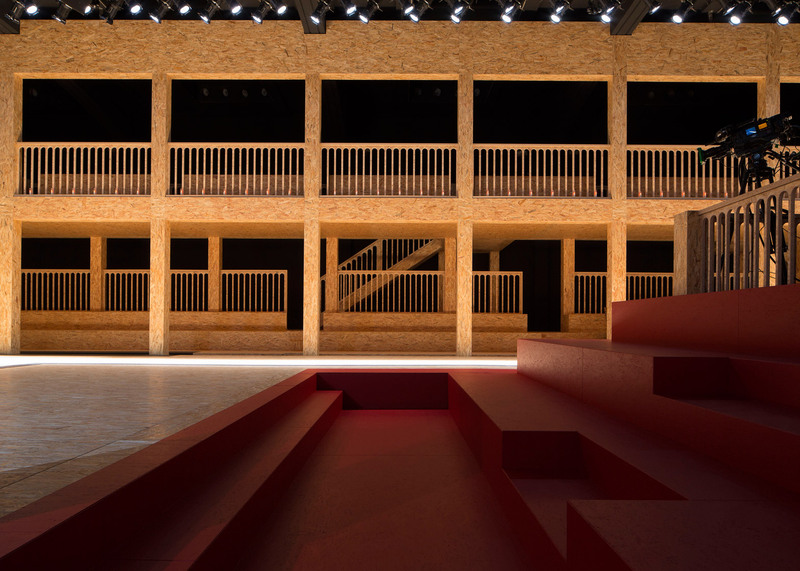 Theatres built for public trials of heretics informed Dutch studio AMO's set design for Italian fashion house Prada's Autumn Winter 2016 catwalk presentations (+ slideshow). 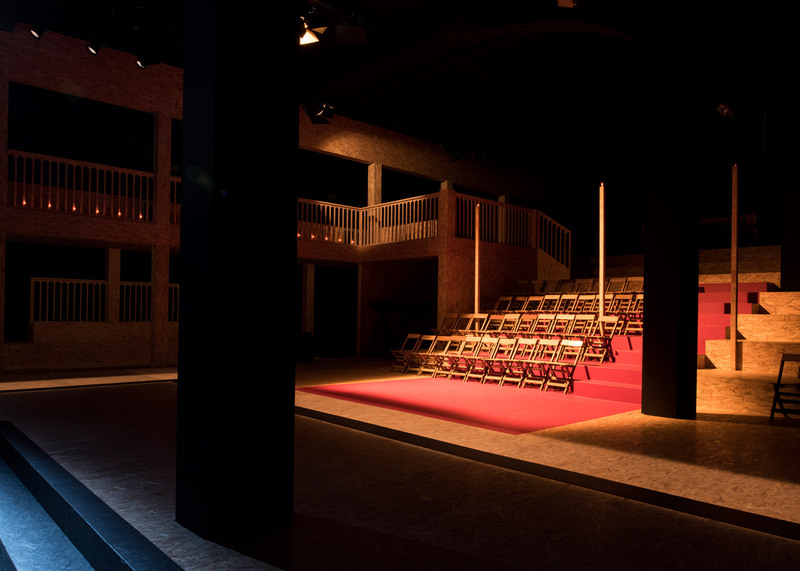 The installation was used for Prada's menswear and pre-fall womenswear show yesterday, and will also be used to present womenswear during Milan Fashion Week next month. 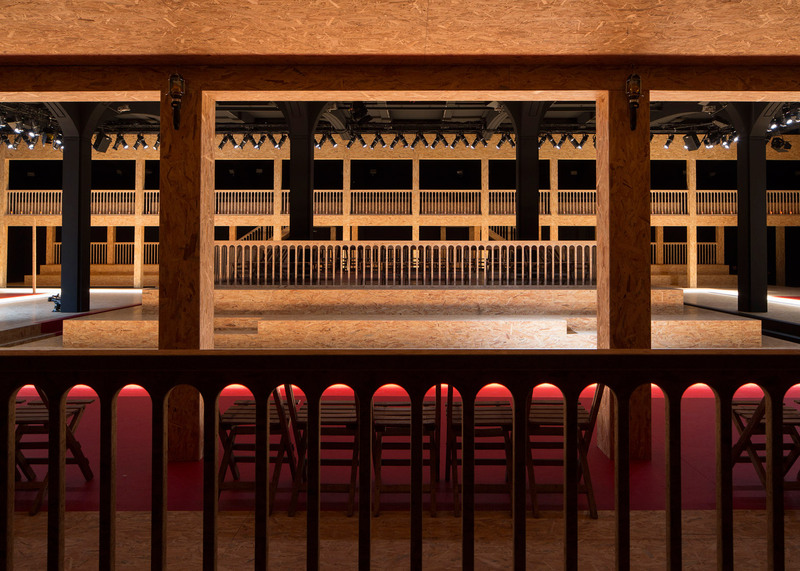 AMO – the research arm of Rem Koolhaas' Rotterdam-based architecture firm OMA – used panels of oriented strand board (OSB) to construct the set at the Fondazione Prada complex that OMA completed last year. The space is based on the theatre-like settings used for auto-da-fé – public trials for heretics during the Spanish, Portuguese and Mexican Inquisitions. These ceremonies took place in urban squares or esplanades. They typically involved a procession of prisoners and the reading of their sentences, before being taken out of the city and burned at the stake. AMO chose to relate this process to the fashion show, which is becoming increasingly publicly accessible through the use of digital streaming and social media. "The division between the role of the audience and actor is blurring: all have become players in the same secular ceremony of the fashion show," said AMO. "No longer relegated to passive observer, the spectator is now an active participant in the events unfolding in front of them." "The mass of fragmented instant data is uploaded and critiqued by a multitude of voices," the studio continued. "This consumption of images is like a public trial, a contemporary transposition of the auto-da-fé." Using the wooded boards, the studio built a peristyle around the edges of the space and series of balconies above. "This assemblage of structures breaks through the building, expanding into the surrounding streets and urban domain," AMO said. Long blocks of the same material form bleacher-style seating on the periphery and a raised platform located in the centre of the room, both for the audience. "No longer bystanders, they become active participants in the ritual unfolding around them," said AMO. 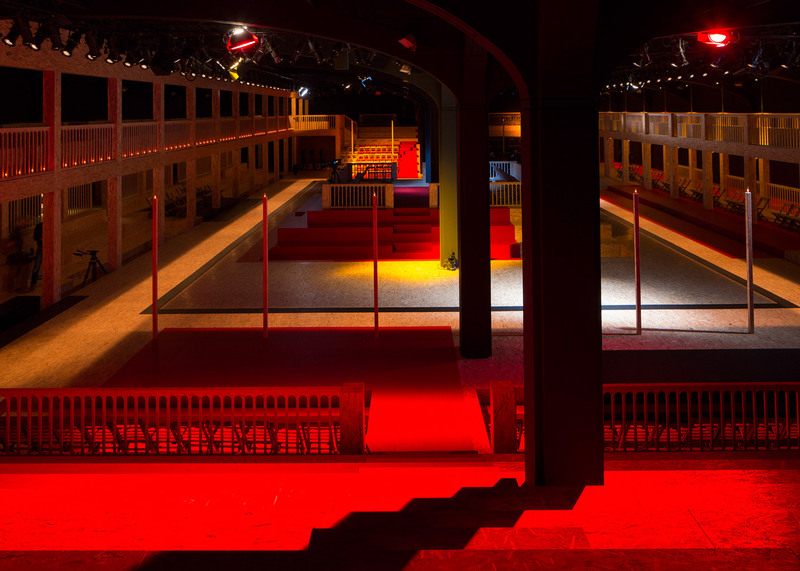 Models parade on a rectangular catwalk, illuminated by rows of spotlights suspended from the ceiling. The lighting was designed to highlight the uneven texture of the OSB and create an atmosphere similar to chiaroscuro – an Italian painting technique that creates a dramatic effect by contrasting intense portions of light and dark. 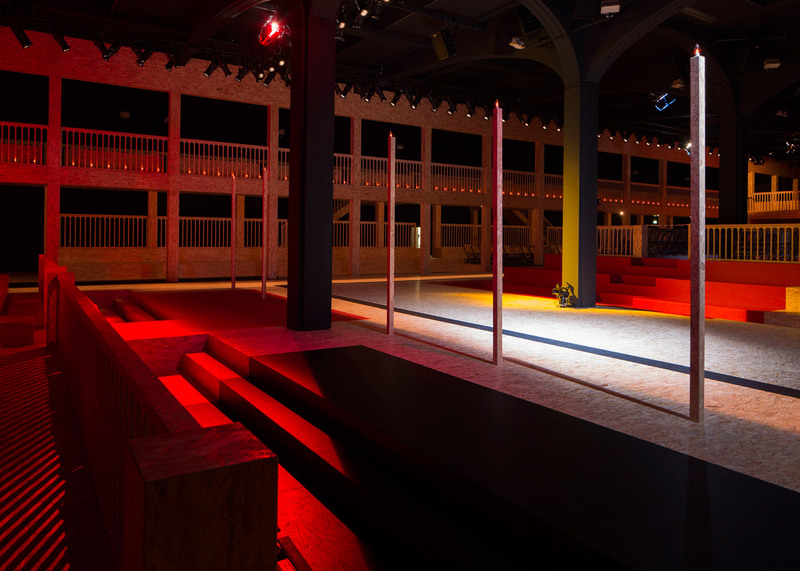 Existing architectural elements including columns and beams – which were white for the brand's Spring Summer 2015 catwalk, also by AMO – are painted black. Prada and OMA have a longstanding relationship. The companies haves worked together for over 25 years as a result of a friendship between their founders, Koolhaas and Miuccia Prada. 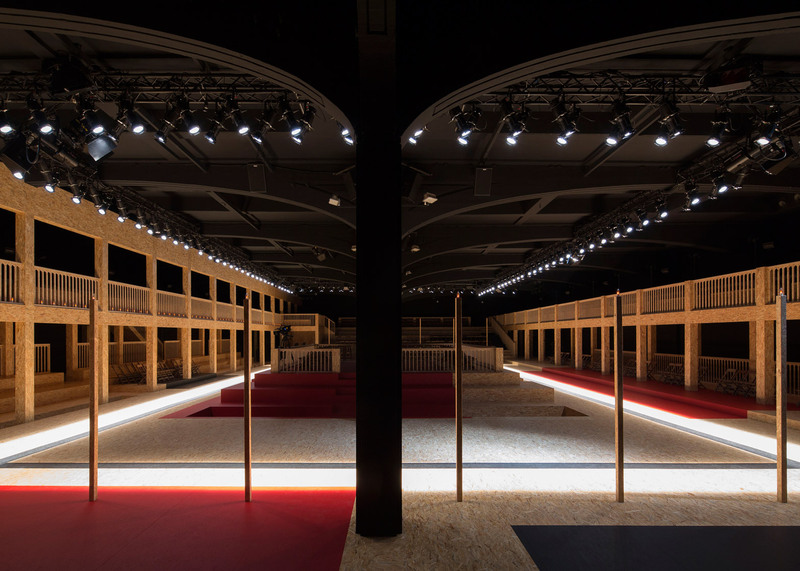 Previous catwalk designs for the fashion house include a series of linked symmetrical vestibules for Autumn Winter 2015 and an installation of translucent sheets suspended above concrete seating for Spring Summer 2016. 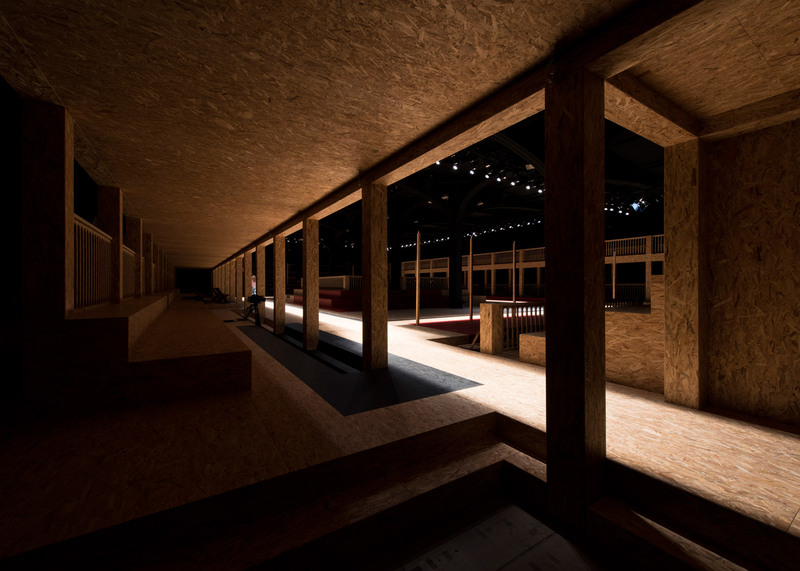 Other projects have encompassed store interiors, furniture collections, a shape-shifting cultural pavilion, and a 1990s-style nightclub to host a one-off event during Paris' Haute Couture fashion week in July 2015.